If I had to make a list of things I love to do it would pick in no particular order: crocheting, reading books, watching movies, listening to music, and playing video games. Since crochet is my main hobby, I thought it would be cool to combine it with my other hobbies by incorporating all my favorite characters from diverse venues into my craft. I started on Fan Art projects a few years ago, and I can’t say that my first attempt was great but it allowed me to improve my crochet techniques in the process. Today I am displaying my favorites. They represent my passion for stories and their characters that inspired me to pick up my yarn. Fan Art is a way to pay homage to the things you love, a form of expression. Let me say that there is life before Star Wars, and life after Star Wars. These movies got me into science fiction when I was a kid, I spent my entire childhood dreaming about space travel, I still do. This little Jedi was one of the first Fan Art I successfully made, I spent an entire weekend crocheting the base, undoing and redoing rows until I was happy with the result. The most challenging part was the coat, I had never crocheted clothes before. I raided the garage to find something remotely similar to a lightsaber until I found a little piece of hardware in a box or random things. I absolutely love him! I started playing World of Warcraft when the first expansion was released 9 years ago. I absolutely love that game, even though I hardly have enough time to play these days because it is time consuming. Raiding dungeons with friends on Saturday night was more fun than going out to a club or a bar. The prospect of getting some epic gear was more exciting than getting a glass of the finest beer. I crocheted this Tauren at the suggestion of a friend who wanted to see if I was up to the challenge. Challenge it was! I had no idea how I was going to do it, and it took me one month to finish it. Patience is the key, to not give up is the reward! One of my favorite TV series is The Walking Dead, I have been following it religiously since the beginning. I am a big fan of Daryl Dixon, and if he dies, I riot! This is the first doll I made with wires inside the body, it allowed me to bend his arms to hold his crossbow, and pose him. I also used metal wire to make the weapon that I wrapped with yarn. He does has his wings on the back of his jacket, never forget the trademark. I didn’t know very much about Frida’s life until I watched a movie about her life years ago. I have great admiration for her work, and who she was. She lived a short but unapologetic life driven by art and bohemia, she was a force of nature. I love the way she dressed, she had a unique style that was part of the inspiration to make this doll. 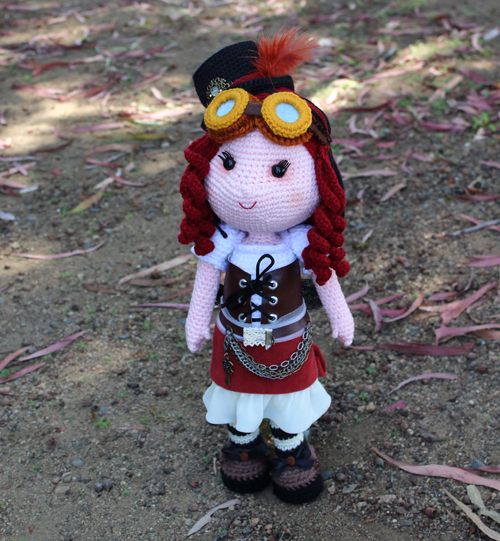 Making this doll was a lot of fun, especially dressing her up. I think this is the first time I used the help of a sewing machine, and fabric. I also put wires in the arms to pose them, but not the legs since they are hidden by the dress. I think she turned out really cute, my little Frida Kahlo. I love role-playing games since the days of Dungeons and Dragons, show me one and I will forget about anything else, even dinner. Crono is from a classic 90s video game called Chrono Trigger, a very likable but silent character with red spiky hair. 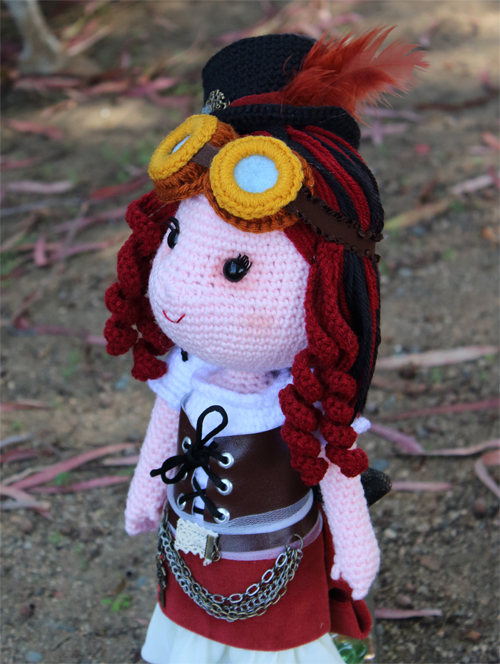 Even though this was an easy doll to make it took a lot of patience to crochet all the pieces for the hair. I embroidered them to the head, and used hairspray to keep them from curling. I didn’t emphasized any details since the character is pixelated in the game, but just enough to make him recognizable. This book has everything I love about children stories, but who doesn’t love it? Max is a beloved character, and I love his wolf costume that inspired me to make this doll. This is one of my most adorable Fan Art project. I crocheted the tail with acrylic yarn, then used a metallic brush to simulate fur. I couldn’t find an appropriate crown, so I bought some gold paper at the craft store that I cut in the shape of a crown, and added felt to go around it. I also used felt for the claws. I think he turned out really cute with his little whiskers which you can barely see on the picture by the way. I would like very much to make one of the monsters someday, when I have the time. Last but not least… This is a video game I was very excited about when it came out. It takes place long before Luke Skywalker was born, one of the many stories of the Star Wars Expanded Universe (you would need an encyclopedia to keep up with all of them). I played it on one of my friend’s computer where I picked a cute little Jawa named Blizz as a companion character. I completely fell in love with it, even though it is as lethal as it is cute with his blaster gun! One of the challenges with this doll was the head. It is supposed to be hidden under the hood, so you are only supposed to see the eyes in a dark shadow. I managed to achieve that effect by making the head black, and adding yellow felt that I painted with fluorescent fabric paint. It was also my first time making a hood, it took several trials and errors to get it right. The side band was cut from a piece of vinyl, which turned out not to be the best material to work with because it doesn’t hold glue very well. I found a way around it but my advice is to avoid it if you need to use glue! Do you like Fan Art? 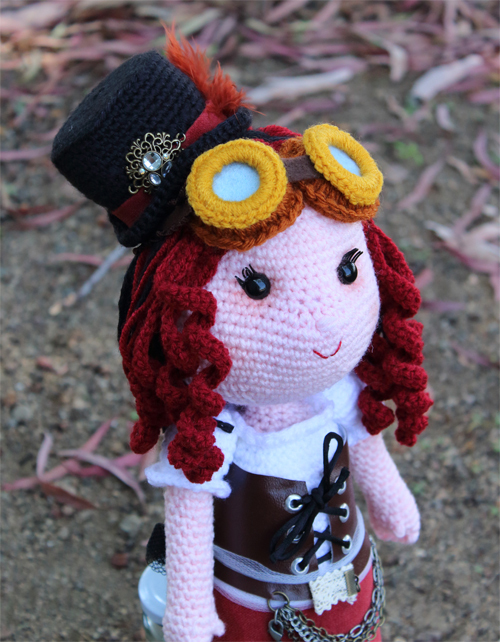 What are your favorite characters you have made, or would love to crochet? Let me know if the comments! Note: I do not have patterns for any of these amigurumi dolls, I usually improvise and take notes along the way when I need to repeat a technique, but that’s about it. 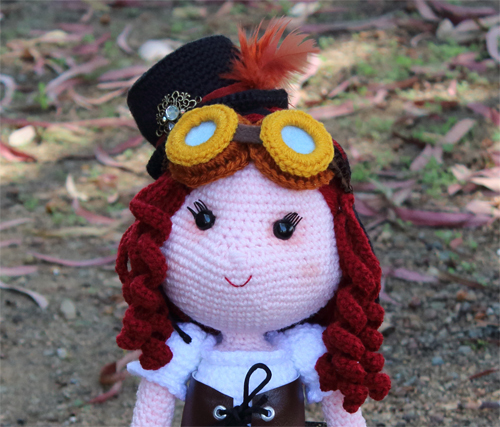 I spent the last few weeks working on the doll of my dreams, a cute amigurumi girl inspired by the Steampunk movement (a subgenre of science-fiction influenced by the Victorian era and steam powered machinery). 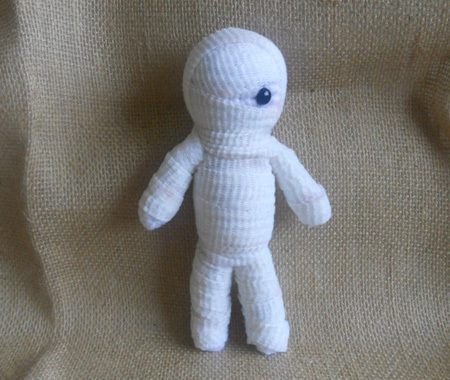 I wanted to make this doll since the day I started to crochet a few years ago, I was just not ready to make one until now. It took me about a month to finish it, on and off, and I am very happy with the result. I named her Mina, for Mina Harvey who is a character from my favorite book of the 19th century era, Dracula. Here she is taking a stroll in my backyard. I was going to create my own pattern to make the body when I stumbled upon a tutorial by Annie-88 on Deviant art to make the an Elsa doll (from frozen), I thought it would be perfect base for my doll. I made some minor changes along the way to suit my doll, but this is a great pattern that is free, and easy to understand if you are familiar with the techniques. I used vinyl and fabric to make her dress, and bought some accessories at the craft store to doll her up. I took me a while to figure out how to make the goggles, so I took a trip to Home Depot for inspiration and bought a set of large PVC rings, and another set of smaller metal rings in the hardware section. I crocheted around them with two different color of yarn, glued them together with felt in between to imitate glass. Then I bought a piece of brown elastic band to go around. It turned out to be easier than I thought it would be. 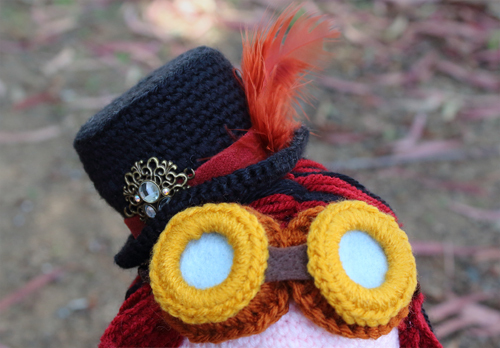 My doll is about 17 inch tall with the hat, I used a 2.75mm crochet hook because I like my stitches to be tight. I inserted some safety eyes and glued some plastic eyelashes before clipping them. If you make this doll I recommend that you put a 4 to 5 inch wood stick inside to hold the head. The neck is very small and cannot hold the weight of the head unless you put support inside. the wood stick keeps it steady. Now all I need is a doll stand that I will spray with brass to fit with the style. 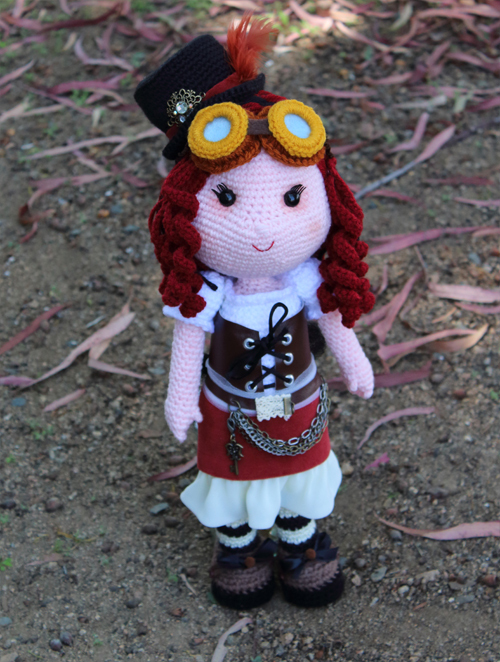 She is a great addition to my crochet collection, I will just have to keep her away from my cat who is very intrigued by the bling on her hat and the little keys dangling from her chain. My next post will be a tutorial to seamlessly change color when working in rounds. I used that technique to make the legs of the doll, and I really like it. 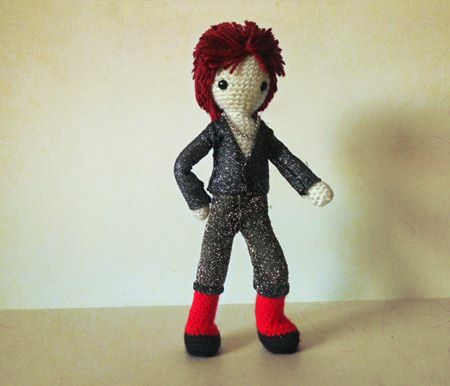 Not long ago I made a post about a new project I had in mind, making a Ziggy Stardust doll based an iconic photo taken in the early 70s by Mick Rock. It’s finally done and I am really happy with the result. It was a new challenge for me, I had to put wires in the doll to be able to pose it, make the clothes with material, and make a chair as well to match the scene. It took me a month to finish it, but I took my time and it was really worth it. It’s not easy to crochet a doll when you have to work around wires, but a little patience goes a long way (well, maybe a lot of patience). 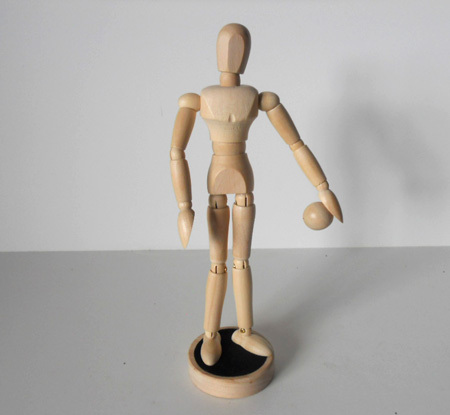 I used a wooden mannequin to help me get the right dimensions of the torso, arms and legs. This is my first time using one and I do not regret that purchase! Here are the two pics side by side. I Photoshopped mine to to get the lighting as close as I could to the original. Since my doll is posable, here another pic standing up. I actually took this pic before adding the pendant, so it is missing on that shot. I really had a lot of fun with this project, now I just need to figure out where I am going to display my doll. This is just the beginning of my Rock N’Roll series, my next one will be based on an iconic photo of Debbie Harry, from Blondie. Update: I tweeted a picture of this doll, and the legendary photographer Mick Rock added it to his favorites. Let me say that it doesn’t get better than that! Today I went to hobby lobby to buy something I wanted to purchase for the longest time, a wooden mannequin. 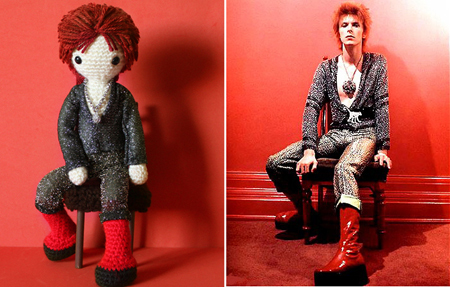 Their purpose are normally for drawing but I realized that it would help me figure out proportions when I crochet dolls, which will come handy for my next project; another Bowie doll. 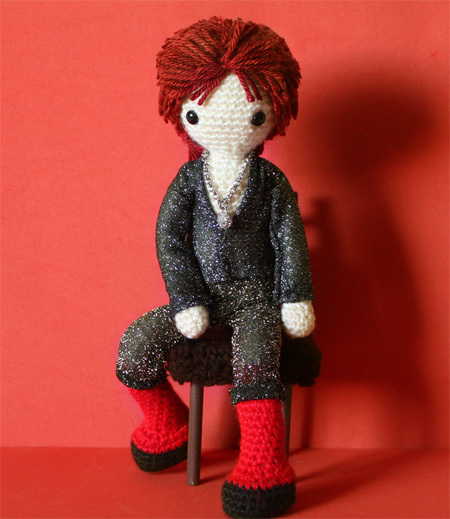 I have made Bowie dolls in the past, three of them actually, so you might wonder why make another one? This time, I am taking it to the next level. I am going to reproduce a scene from a photo that was taken during the Ziggy Stardust era. 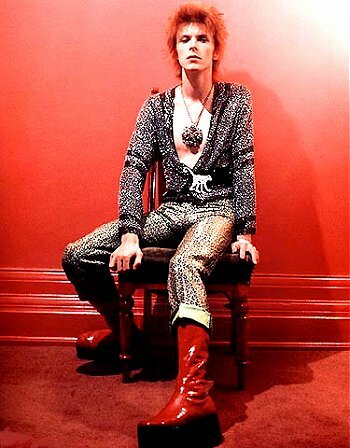 He is sitting on a chair, wearing his famous red boots, and a very glittery outfit. 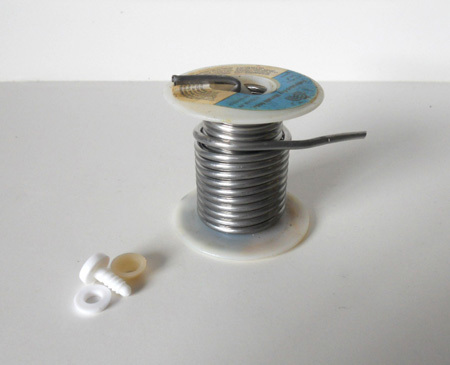 I am going to use wire and doll joints to make the doll posable, this way I will be able to make him sit in the same position as the photo. I will also make the chair, and set it on a red display. I am also using fabric to make the clothes instead of crocheting them. I found some really cool glittery material that looks similar to his outfit, it will allow me to put my new sewing machine to good use. 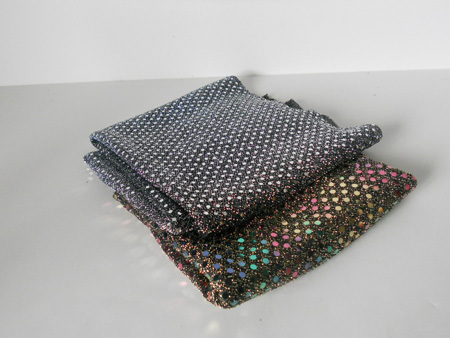 Glittery fabric for the clothes. This is definitely not a small project, but that’s what I love about crafting. I have no idea how long it will take me to make it, but since time is not of the essence I will just have fun with it. Knowing me, I am going to get so obsessed with it that I am going to turn into an anti-social maniac until it’s finished. Well, I better get started! I will definitely post more about this project as I go, and if all goes well, I will continue this as a Rock’N’roll series.